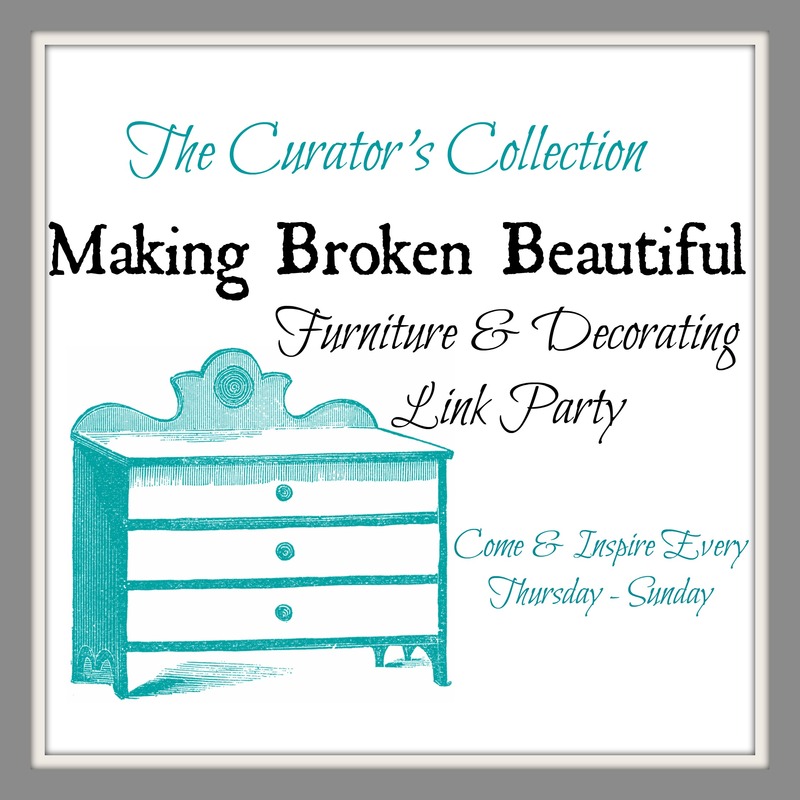 Welcome to Making Broken Beautiful! I spent most of the day yesterday editing photos and building a new coat rack! Since I sold the other one I made, (click here to view) there was a bare space that needed to be filled. The new rack is constructed out of old corral wood that was brought back from the Northwest Territories. A friend of ours has a farm (the only farm) in Hay River NWT and brings me some goodies sometimes! Needless to say, the wood is well weathered and perfectly grey! More on that soon! Now … If you love furniture and home decorating and design then this is where you want to be! I hope you have all had an amazing week so far! Okay! Let’s get to the goooood stuff! I just want to say that I am relieved that I am not the only parent that is willing to sacrifice the comfort of my children when coming across a roadside find! 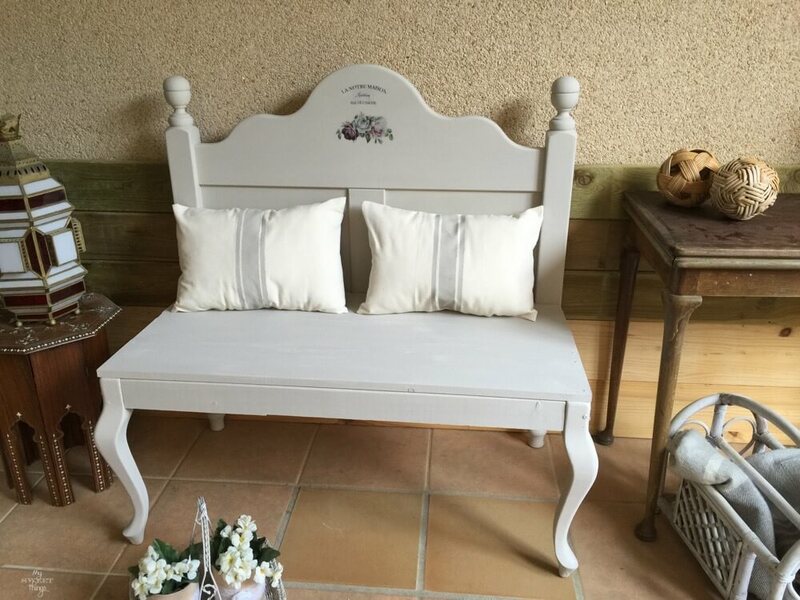 Pili from My Sweet Things created this amazing bench by marrying together a roadside headboard find and some chairs! It is gorgeously executed Pili! You must go check out the how to’s on this one! 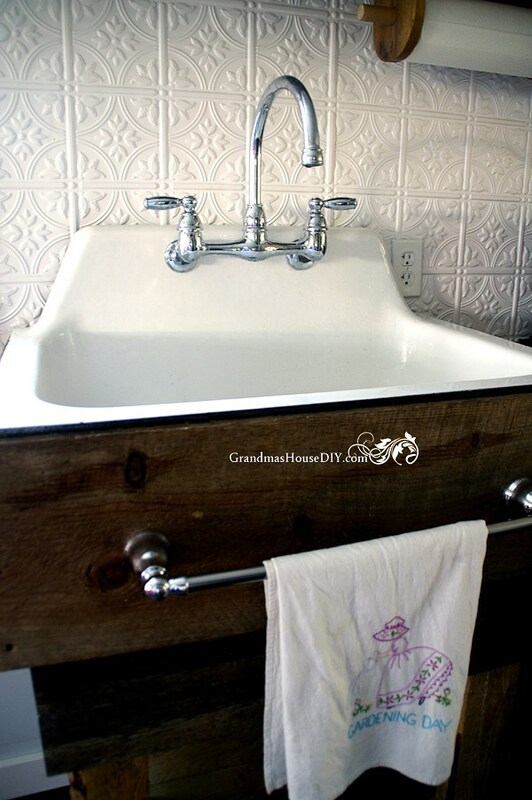 Tarah from Grandma’s House DIY literally took a sink that you or I would have thrown out and turned it into this amazing rustic piece made from SCRATCH! It looks like it was always this way! Impressive Tarah! Well done! Give her a quick visit to see how she did it and out of what! A little elbow grease really does go a long way! Sarah from She Holds Dearly Shared these amazing custom Slipcovers she made for her reclining wingback chairs. They turned out beautifully! For a full tutorial on how to do this for yourself, hop over to her blog. 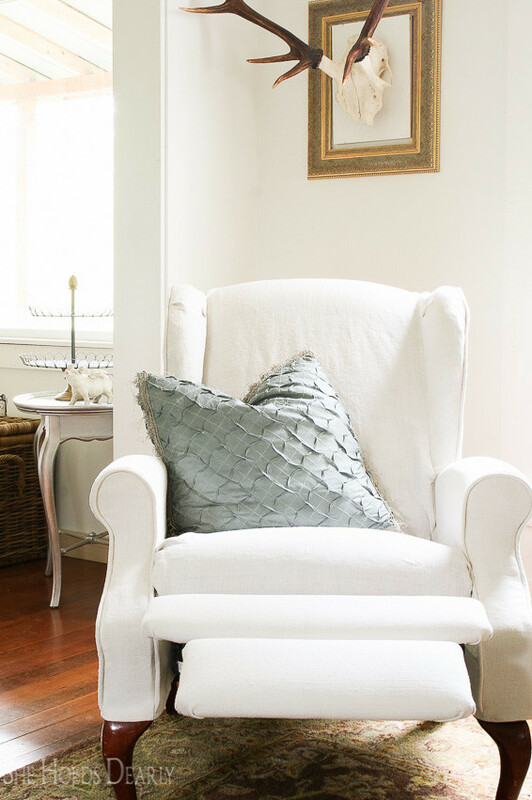 I never thought about slipcovers for recliners but this turned out beautifully! Patricia from The Wood Spa shared this custom finished hutch. She brought it from farmhouse cute to farmhouse rich! It turned out lovely! It’s amazing what a little grounding and contrast will do for a piece. Well done Patricia! You need to go check out what this piece looked like before to know what I’m talking about! So happy to have you join in every Thursday, it’s a pleasure to host your creativity and talents! Thank you for the inspiration you bring here each week! Thank you so much for the link up and the opportunity to share here! Thank you for taking the time to share your creative talents here Kimberley! So happy you could join in today! Have a great rest of your week! Love the sink. Such a good idea to put the towel bar on front. It really is charming isn’t it? Thank you for popping by today! I hope you have a great day! Thank you so much for featuring our kitchen sink base! Well deserved Tarah! I love this piece! I hope you have a great day and thank you for sharing here! Sweet Terry, thank you so much for promoting my recliner slipcovers! You are so generous and I’m so happy to have met you! You are so welcome Sarah! You did an amazing job on them! I hope you have a great week! Oooh! 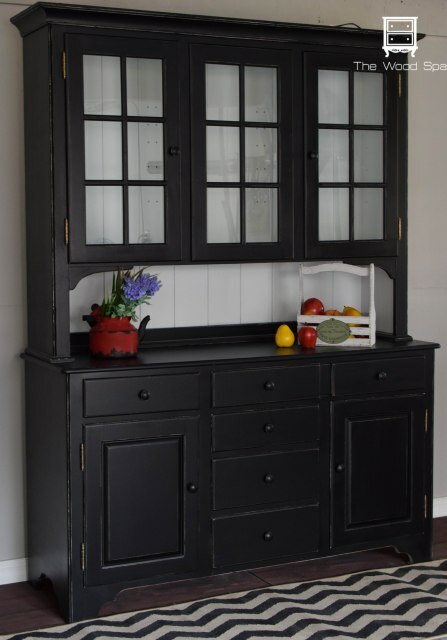 Love that black hutch! It is very pretty isn’t it? Thank you for popping by today Vicki! I always enjoy your pieces! Have a great day! Thank you Cynthia! Thank you for joining in and supporting this small party! I so appreciate it! I hope you have a great weekend as well! Happy Weekend Terry! I look forward to this party each week to see what amazing projects furniture reimaginers have created. This weeks features did not disappoint. Happy Weekend to you as well Marie! Thank you for sharing your talents here! Terry, thank you so much for the feature!! Now that you say it, I am also relieved I’m not the only one who is capable of bringing stuff inside the car with the kids on… I felt a bit guilty sometimes, but feel much better now. I would love to invite you to our new Sweet Inspiration party which goes live every Friday, http://sweethings.net/sweet-inspiration-link-party1/. You are so welcome Maria, you do beautiful work! Hope you had a great weekend!